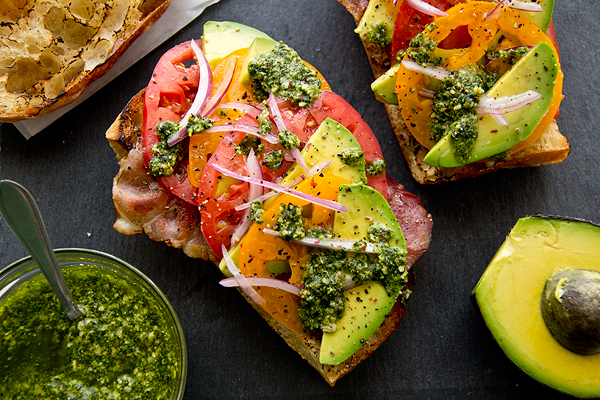 Savory, fresh, and deliciously colorful, this avocado toast features crispy prosciutto, fresh tomato, red onion, and a bright pesto to create a healthy and light meal! Rich, creamy, and deliciously decadent—those are the words I would use to describe the glorious qualities of a perfectly ripe avocado, that highly prized piece of delectable produce. Fresh avocado is wonderful to enjoy whether it is simply cubed, turned into a plated salad, mashed into guacamole, or sprinkled with salt and a drizzle of lemon or lime; but when it is sliced and paired with a few other bright and colorful ingredients to create avocado toast, it becomes a simple-yet-exquisite culinary pleasure for me. Avocado toast, so easy to prepare, is a beautiful and simple way to enjoy healthy food, and get all of those good, necessary fats, vitamins and minerals that we all know we need, without sacrificing the most important thing of all when it comes to food: the flavor. 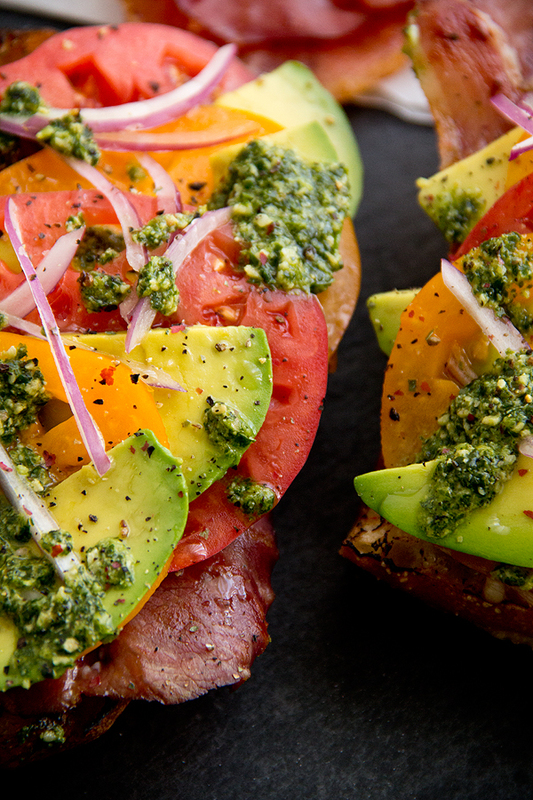 When avocado toast is prepared with perfectly ripe avocado, a couple of slices of juicy heirloom tomato, a whisper of red onion, plus the wonderfully salty and savory bite of crisped up prosciutto, it is clean eating at its best. A delicious avocado toast recipe calls for good quality rustic bread, lightly toasted, and balanced with something savory, perhaps slightly sweet, and finished with a little acidity. For me, those delightful flavors are found in crisped prosciutto, freshly sliced tomatoes, and thinly sliced red onion. And because I love an earthy and easy pesto sauce, one made with fresh herbs, garlic, good olive oil and perhaps a few sunflower seeds for texture, I drizzle it over top of avocado toast as a tangy finishing touch. To toast my bread, I brush a small amount of olive oil over it and toast it until golden-brown either under my broiler, in a large toaster oven, or even directly over the flames of my gas range (this creates that bit of char around the edges—I love that!). Next, I crisp my prosciutto for a couple of minutes on each side in a large skillet over high heat, just until it curls up at the edges. I build the avocado toast by simply by layering a slice of crisp prosciutto, followed by thin slices of fresh avocado, a couple of slices of tomato and a few thin wisps of red onion; then, I drizzle over a spoonful of my easy pesto. This avocado toast comes together in just a few minutes with only a small handful of ingredients, but the flavors and the presentation are deliciously bold and feed not only the appetite, but the eyes as well! Rustic bread is best: I love ciabatta bread because it is nice and hearty, and toasts up well; and because it is slightly chewy, offers a nice texture perfect for avocado toast. Colorful tomatoes: The large, bright heirloom tomatoes that are both yellow and red are my favorite for this recipe because they offer a lovely pop of extra flavor. But feel free to use whatever variety of tomato is sweetest and most ripe, or the kind you enjoy most. 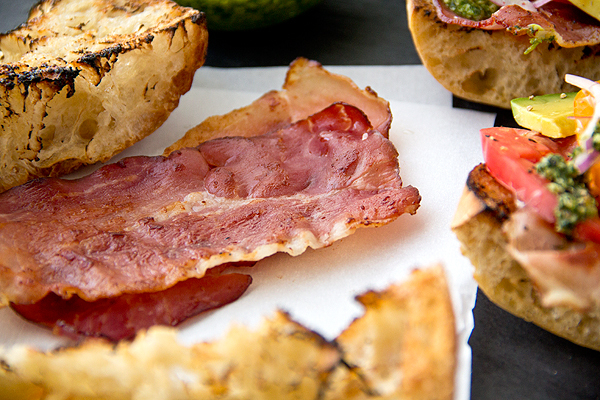 Prosciutto, the extra touch: A slice of salty and crispy prosciutto is such a treat to add to avocado toast, and provides a bit of depth and smoky flavor; but feel free to leave it off if you would like to prepare these as a vegetarian option. Homemade pesto, or store-bought: I offer a little recipe for a cilantro-sunflower seed pesto as part of my avocado toast recipe, but feel free to use store-bought for convenience, or even skip it altogether. You can substitute a sprinkle of fresh cilantro, a drizzle of good olive oil, and a tiny squeeze of lemon instead. 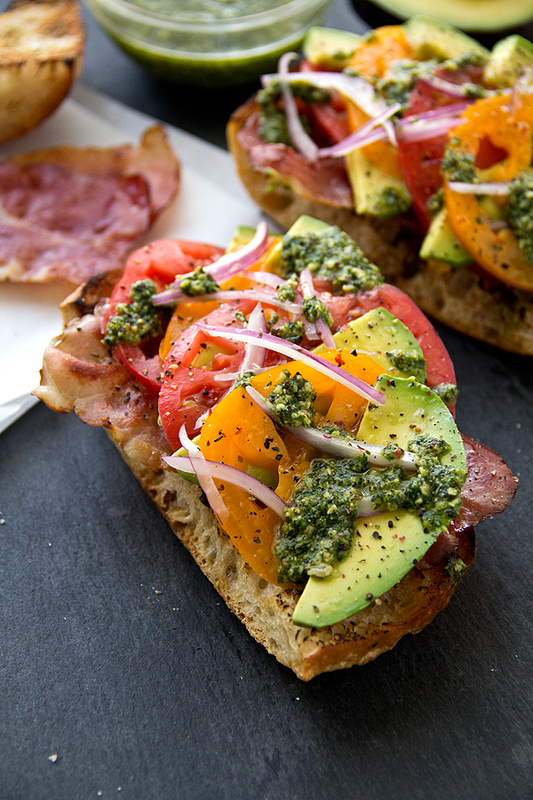 This colorful avocado toast features crispy prosciutto, slices of fresh tomato, and a drizzle of homemade pesto piled atop of toasted ciabatta bread. -Crisp the prosciutto by heating a non-stick pan over high heat and adding the slices to the pan just until the edges curl and the slices become crispy and golden; remove from pan and set aside. 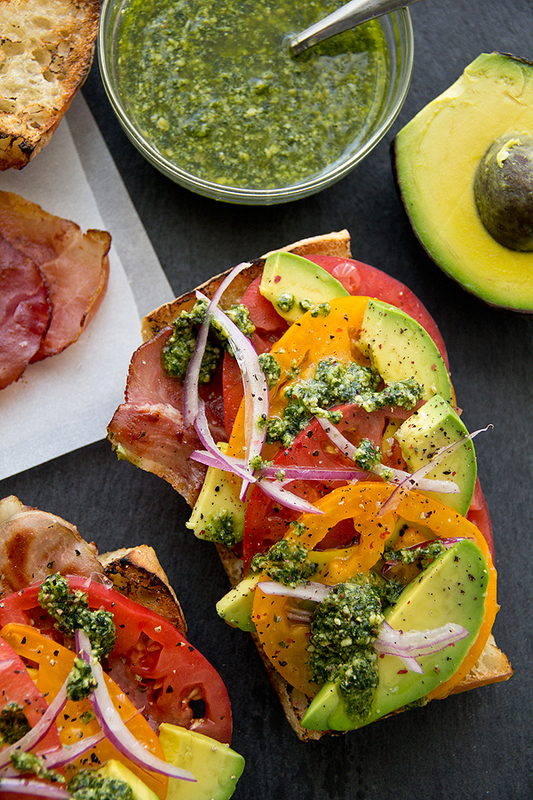 -Build the toasts by putting one slice of the crispy prosciutto onto the toasted ciabatta, and next alternate to your liking the avocado slices (each toast gets 4) and heirloom tomato slices (each toast gets 2 yellow and 2 red slices). -Sprinkle just a few thin slices of red onion over top, and finally finish with a light drizzle of the pesto for a little fresh zing. Hungry for more avocado-filled recipes? Check out this Avocado and Tomato Salad, or this fresh Guacamole! Cook’s Note: This recipe was originally published in 2012, and has been updated with even more love! First I have to tell you I love your hair! I go back and forth between long (to the middle of my back) to really short. I’ve been long a couple of years and am thinking of doing the chop. Right now I am envying your short hair. Now to your beautiful food. These open faced sandwiches are so colorful and pretty, and I am a sucker for a good vinaigrette. I will so be trying this one. Kari, I had long hair for a while, and couldn’t be happier that I took the plunge about a year and half ago and chopped it; I think that some version of short hair is going to be the best for me from here on out! Thanks for your comments. Wow! Does this ever look delicious. The colors jump off the page. How about a drizzle of balsamic! Awww, that’s great Irini – thanks for coming back to share that with me! This is awesome,first time I visit your blog. I was looking for a recipe to make crispy prosciutto and tumbled upon this. Im filling chicken breasts with brie and prosciutto for my boyfriend´s birthday dinner and thought of making something fun insted of wrapping the cheese with it. I also love cilantro and this Vinagrette is a great idea as well, thumbs up to using sunflower seeds! Its just great overall. Hi Victoria, thanks! Your chicken breasts sound delicious – best wishes on your boyfriends special birthday dinner! Just found your site! This sandwich looks awesome! I’m going to make this weekend…can’t wait. I think this is great for hot summer days! I can’t wait for summer so I’ll eat it now! Thank you! So glad to stumbled upon your site. I am inspired to make this tomorrow. Looking at the ingredients, I have the ingredients needed. 🙂 I enjoy reading your post and your husband’s capture the essence of your passion (food) beautifully. Bravo to both of you! 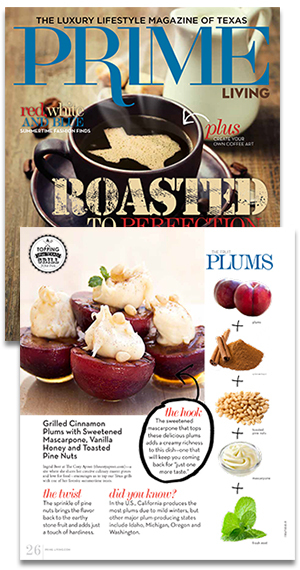 Hi Tina, thank you so much – hope you enjoy this recipe! Is the nutritional info listed anywhere? 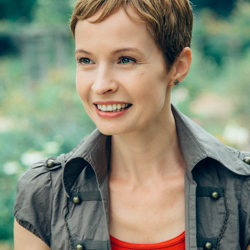 Hi Kym, I like to use this site here for nutritional info. Hope that helps!